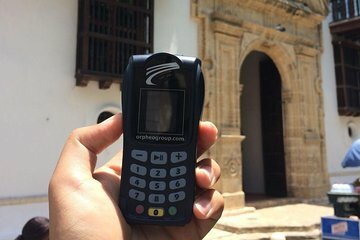 Enjoy your own independent exploration of Cartagena with the help of local experts thanks to this interactive audio guide tour. Learn about the highlights of this historic UNESCO World Heritage-listed Colombian city with the help of historians, fun sound effects and professional narrators. Along the way you’ll hear stories about pirate attacks, colorful characters, architecture, fashion and local customs.. Best of all, you can take this audio tour at your own pace in whatever order you like. Your purchase includes a drop-off of the guide at a location of your choosing. Una muy buena experiencia y muy buena la información de las audioguías. Excelente la atención. Nos llevaron los equipos al hotel y los retiraron de allí al día siguiente, lo que nos simplificó mucho las cosas, ya que estábamos con muy poco tiempo. El único punto en contra es que uno de los tres equipos se quedó sin batería al poco tiempo.